Intuit is a legend among Silicon Valley legends. Founded at the dawn of the PC revolution by Scott Cook and Tom Proulx, the company fended off competitors including Microsoft to become the dominant maker of software for personal finance and small business ac- counting. 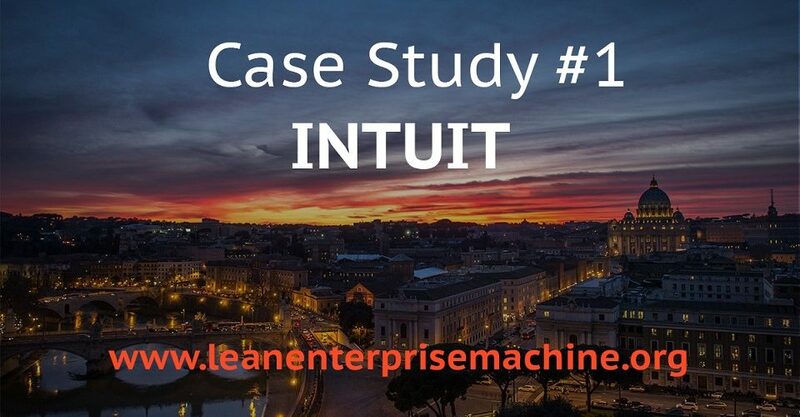 Intuit was an early adopter of principles later incorporated into the lean startup method, so by the time the lean startup movement reached full flower in 2011, the com- pany — by then an full-scale international enterprise — embraced it wholeheartedly. Hugh Molotsi joined in 1993 as a software engineer and eventually took on leadership of innova- tion. As vice president of Intuit Labs, he’s responsible for encouraging and supporting in- novation throughout the company, which employs 8,500 people and generated $4.15 bil- lion in revenue during fiscal 2012. He blogs at blog.hughmolotsi.com. How do you structure your innovation activities? Do you have a special innovation division? One of the things that makes us different from many companies is that we consider in- novation everyone’s job. There’s no set of people who figure out what we’re going to be do- ing in the future. Good ideas come from everywhere, and front-line employees who are in- teracting with customers are more likely than executives to have the key insights that we need to come up with new ideas. How do you manage innovation without a structure? Well, it’s literally unstructured. Every Intuit employee gets 10 percent of their time to work on ideas they think will drive growth. We call that unstructured time. We don’t track it; we just put it out there as an aspirational goal and let people decide for themselves how to spend it. We teach everyone two core capabilities: customer-driven innovation and De-sign For Delight, which is our version of design thinking. So people spend time at their dis- cretion coming up with ideas and moving them forward. How do employees get resources they need to develop their ideas? Once you have an idea, the main challenge is to get it into customers’ hands. We cre- ated Intuit Labs as a sort of service organization that helps employees run experiments and develop products without needing management input, support, or resources. There are about a dozen of us. Our epiphany was that unstructured-time teams are startups, and they frequently run into similar kinds of challenges. We’re trying to make it easier for them and turn ideas into minimum viable products that they use to run experiments with cus- tomers. Some people need an iOS programmer, designer, web host, payment processing. We try to eliminate those problems. Or they can sign up for an Incubation Week, which is a week of intensive coaching from other developers and designers with the goal of releas- ing something to the public by the end of the week. Once they’ve built an MVP, they can use the Intuit Labs web site to acquire their first customers. Does Intuit Labs have a physical location? No, it’s more a conceptual notion. It’s a friendly place for innovation teams that grow out of unstructured time projects and aren’t getting the support they need from manage- ment. How do you keep innovation efforts free of interdepartmental politics, budgeting cycles, and other roadblocks that typically hamper enterprise innovation? That’s hard. We run into it all the time. My short answer is, unstructured time is free of all that by definition, because employees are free to use it as they see fit. If someone wanted to develop a Windows Mobile application, their manager might say, “Windows Mobile isn’t one of our strategic mobile platforms,” but that wouldn’t stop the person be- cause that person has full prerogative over how to use that time. That’s a big way we un- buckle ourselves not only from legacy applications but from what might prove, over time, to be an ill-conceived strategy. A few years ago, our big mobile platforms were Windows and Blackberry. Fast-forward and it’s all about Android and iPhone. We’re constantly mak- ing decisions about what we’re going to focus on, but they change very quickly. Sometimes, in hindsight, we realize that it wasn’t the right strategy. The beauty of unstructured time is that we’re not hindered by that strategy. If somebody has passion, they can go for it, and if it works, it can grow into a major line of business. How is the staff compensated? Would it be productive to structure compensation like a typical startup, in which founders give up as much as half their salary in return for equity in the pro- jects they develop? We don’t do anything special. When people work on unstructured time, their motiva- tion is less about becoming wealthy than the sense of accomplishment and pride in improv- ing customers’ financial lives. People who do well at innovation are rewarded in the nor- mal ways that we manage performance and provide compensation. For instance, some- body who is a product manager probably would get promoted. Having said that, every year, we recognized employees for having delivered real benefits in their work around inno- vation. The Scott Cook Innovation Award is a company-wide recognition. Winners get three months of full-time or six months of half time to work on whatever they want, be- cause innovators have asked for more time to follow their passions. They also get a vaca- tion anywhere they want to go for themselves and a significant other. Do you worry that entrepreneurially minded people will leave? Absolutely. In our Rotational Development Program, we look for people who have just graduated from college and have high leadership attributes and entrepreneurial capabili- ties. They tend to have a great impact when they come to Intuit. But like with most millennials, long-term retention is a challenge and many leave after a few years. They say, “I have this idea. I’d rather work in a small company or start something myself.” At the end of the day, there are pros and cons to taking that risk with a small company. The ones who have stayed for longer careers find Intuit compelling as a growing company with lots of op- portunity to drive your own projects. How do you choose which projects to support? How do you prioritize? That’s a problem we look forward to having. We look for who’s most ready to build an MVP. Sometimes it’s very clear what a team aims to build and the issue is having time or support to do it. Those teams are perfect for us to help. On the other hand, we can usually see when someone has an idea that hasn’t really been thought through. Sometimes we rec- ommended that they sign up for LeanStartIN, our internal version of the Lean Startup Machine. At the end of that experience, they’re usually in a much better place to know what they want to build and test. Over 100 teams have gone through it, and they’ve been successful to the tune of generating $20 million in new revenue in eight months. How do projects get funded? We help the teams get to a point where they have a compelling story that they can pitch to a business unit for funding. On rare occasions, we see something that looks like it could be a big strategic business for the company, but it doesn’t align with any of our exist- ing business units. We don’t want to lose the idea just because it doesn’t fit into our current company structure. In those cases, we may end up funding and incubating it as an Intuit Labs project. Brainstorm is a great example. It’s a collaborative idea generation tool that began as an unstructured-time project, and we use it internally. A few years ago, we de- cided to try to sell it to other companies. It’s a small business. It doesn’t fit any of the busi- ness units we have today, but we feel like it could be a good business for Intuit. What role does the lean startup method play in all this? We’re applying the lean startup across the board in terms of how we build products. We used to have this debate: Do you figure out all the requirements up front, come up with the perfect plan, the right architecture, and then you build it? Or do you get ideas into customers’ hands and experiment? That’s no longer a debate. Lean experimentation is the approach we use. Do you use innovation accounting to track the progress of projects before they earn substan- tial revenue? We have nascent thoughts about how to use innovation accounting. The lean startup method has had the biggest impact on our approach to developing new applications. We do rapid experimentation, we value data over opinions, and we look for efficient ways to get that data. How do you know when one of your projects has reached product/market fit? Right now, it’s very qualitative. During the month after SparkRent first went out, the team got a couple dozen landlords to sign up, so they were confident they had a good fit early on. On the other hand, BizRecipes has been out for a couple of months, and we’ve got some good traffic, but I don’t’ think the team or anyone else feels like we’ve nailed product/market fit. As we mature, I suspect that we’ll get much more rigorous in how we make that decision. Do you integrate oversight of incubation, acquisition, and strategic investment, or are they han- dled separately? Right now they’re separate, but we’ve been talking about integrating them. Historically, we’ve been able to move really fast in partnership with outside entities, and a partnership can become an acquisition later. We’d like to make partnerships an element of how we help internal startups move faster. How can we make it easy for an internal startup team to work with an external entity to design a test, run the test, and decide whether we want to do something more formal with that entity? That’s not my focus this year, but I’m think- ing about it for the future. How do you scale innovation efforts? Our goal is to get half of our employees to use unstructured time, so half are doing some sort of exploration. That translates into quite a lot of activity. Scaling up is about teaching people about the tools and techniques. Then, hopefully, they can incorporate those things not just into their unstructured-time projects but into their day job as well.